ELECTION ‘12//SAN LEANDRO CITY COUNCIL DIST 4 | During two past San Leandro city council candidates forums held last September, District 4 candidate Chris Crow ran through a list of endorsements, including one from Alameda County Supervisor Wilma Chan, the city’s representative–except, it wasn’t true. 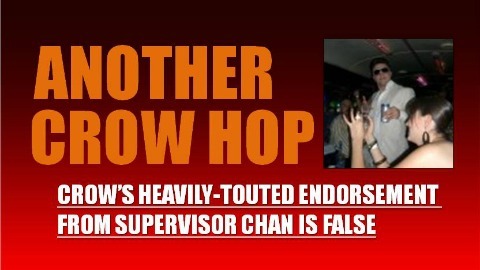 Chan’s chief of staff, Jeanette Dong, told The Citizen last Tuesday, the supervisor has not made an endorsement in the race featuring Crow, Heron Bay Homeowner Association President Benny Lee and residents Darlene Daevu and Justin Hutchison. “Wilma has not endorsed anyone in that race,” she said. Crow did not respond to an email Wednesday asking for details about the false endorsement. During the Sept. 25 League of Women’s Voters forum in San Leandro, Crow last touted the backing of Chan, likely the most influential Asian American public officials in the county. However, there were grumblings even then about its efficacy. In the meantime, Crow is contending the growing number of controversies swirling around his candidacy over the past month is actually helping him gain support from voters. But, the lingering allegations may hurt Crow come Election Day next Nov. 6, according to some local observers, but may not necessarily represent a knockout blow to his chances, they add. However, according to the last U.S. Census, Asian Americans with nearly 30 percent of San Leandro’s population, became the once-entirely Caucasian East Bay city’s largest demographic for the very first time in 2010. Posted in Benny Lee, chinese, Chris Crow, Darlene Daevu, endorsements, Facebook, Jeanette Dong, S.L. City Council, san leandro, Wilma Chan. Bookmark the permalink. Why did you flunk the bar exam, cant be lawyer, Marga Lacabe…? Chris Crow is hiding in Mama ga's underarm – nice and warm, little smelly. That comment is extremely innapropriate! Steve please delete comment. Geez man what kind of hate do you have in your heart to suggest that. He didn't committ crimes? He has done a few things wrong, but man! Senior Center SL city council debate on Sept. 19th – youtube at “4:57” – Chris Crow said out loud of his endorsement from Supervisor Chan. Crow added another lie to his campaign! Inferior Marga's bullying, contradict herself comments aint going far. This no self-esteem blogger behind internet attacking folks is her way getting attention. Most of her stuffs are bias, NOT INTERESTED.